Cambridge cyclist Rushlee Buchanan leads the elimination race of the women’s omnium at the UCI Track Cycling World Cup in Canada. Photo – Guy Swarbrick. 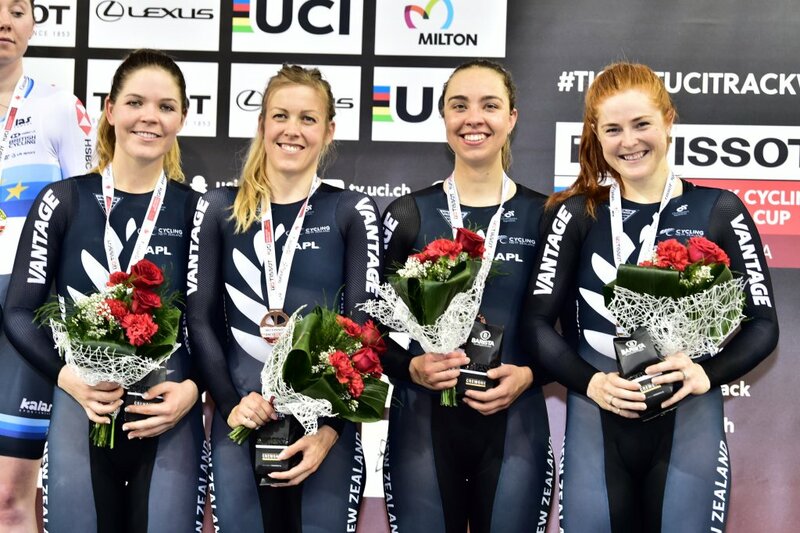 Cambridge riders Ellesse Andrews and Rushlee Buchanan claimed bronze in a tight battle against Germany in the women’s team pursuit final at the UCI Track Cycling World Cup held October 26 – 28 – the crew’s second medal in as many weeks to highlight day two of the competition in Milton, Canada. The Kiwi quartet of Ellesse, Rushlee, Kirstie James and Bryony Botha (with Holly Edmondston coming into the line-up for the final after being ill that week) got ahead by 0.1s at the halfway point with nothing separating the two teams at the 3000m mark. However, the New Zealanders dug deep with a closing 1:03.309 effort to grab third in 4:19.247 with Germany half a second behind. Great Britain grabbed the gold medal in 4:18.138 from Italy in second. The women’s team pursuit on the podium. Photo – Guy Swarbrick. “Overall we are happy,” said Kirstie James. “We tried some new things here, bringing in a new rider in Ellesse Andrews who did well. In the final we went out to execute the first 2kms on a schedule and race the last 2k. 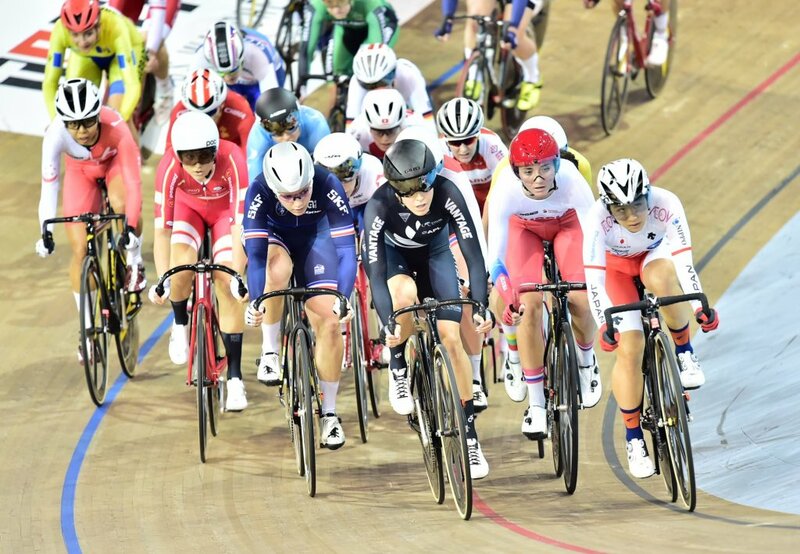 On the final day of the competition Rushlee Buchanan also finished ninth in her first omnium, placing 20th in the scratch race, fifth in the tempo, sixth in elimination and ninth in points. 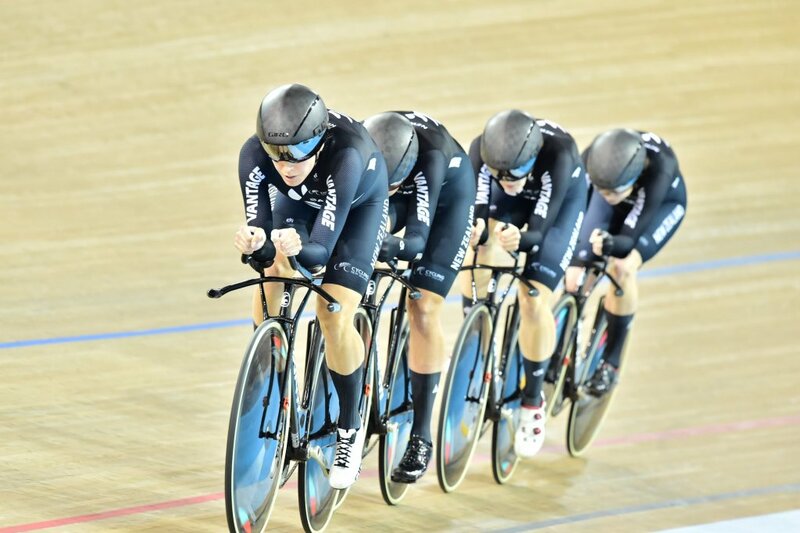 Rushlee Buchanan leads the New Zealand team pursuit through the qualifying round, where they were third fastest. Photo – Guy Swarbrick.